At barely 100 pages, this book--actually a chapter from a larger work so more accurately an essay--is a very easily accomplished read. As you may guess from the title, its focus is Auschwitz, and it goes over the orders to start building this death camp to the evacuation when the Red Army approached. It's very concise, and never lingers on one thing for too long--although having read it and learned more information about these goings on, I am interested in learning more. The book was so engrossing that I felt--I don't know, almost sadistic myself for wanting to read more and more about it. Nonetheless, I believe it's very important to look into these matters, if only to realize that these horrendous acts can be committed without compunction by normal people--if not a certain person in particular, then by many others in our species who are not so different from us. This is an excellent mini-history of Auschwitz, covering all the salient points in a mere 100-odd pages. I, who have read over 250 books on the Holocaust, learned something from this book in spite of its short length. I would especially recommend this to people who need to know about Auschwitz but aren't up for intensive study on the subject. I had to read this for a World War II history class. Short but effective. A really great glimpse into the authoritarian regime and its inner workings. Filled with subtle descriptions of the ironies and horrors during the camps. I really enjoyed reading this book. The only thing I have to say is if you don't like reading strictly facts, I wouldn't recommend reading this book. Definitely my favorite memoir I read this semester! Of all the literature I have read on Auschwitz, this may have been the shortest, but it was the broadest in terms of disclosing the roots, history and back story of how Auschwitz came into existence. Additionally, the author paints a painfully detailed recount of life and death for those who found themselves behind the barbed wire death camp. The images the author conjures are haunting and horribly vivid, but it's an important part of history that will soon have no living survivors to testify as to the horror they experienced. May such atrocities and evil deeds never again befall on mankind. Truly, this essay sticks with you and should be considered required reading, not only for those who are dedicated to learning about the Holocaust, but by all. Written testimonies are the one thing that lives on after the survivors are gone to ensure that future generations will never be swayed as to the legitimacy of these kind of infamous events in history. I took a break from all the fiction I've been reading to read this book. I had some spare time at work and thought it could be useful the next time I teach about the holocaust. The book is not very long, I was able to read in a few hours. It is well written, informative, easy to follow and interesting, although obviously heartbreaking and depressing at the same time. 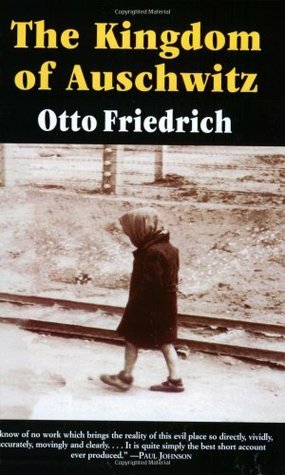 It is very readable for a nonfiction account, I learned a lot, and I think I could actually use portions of it with my students to help them learn about the holocaust. Ah, this is hard to read, as it should be... we are traveling to Auschwitz this fall and this was on the recommended book list. It is short (100 pages) and gave me enough of the flavor of what happened there and the organization of the camp, that I feel my experience of going there will be enhanced. It is not a current book, but the history unfortunately doesn't change so it is entirely relevant today. A short 100 page read that concisely describes the horrors of Auschwitz. The insane thinking behind the building and operation of the camp is aptly captured. The horror is that the genocides have continued in Cambodia, Rwanda and the Sudan. It seems history is doomed to repeat itself. I visited Auschwitz earlier this month, and this is an excellent companion to the visit. I recommend reading this before you visit. Even if you're not planning a visit, it's an excellent (though difficult) historical read. This book is about Auschwitz, a concentration camp during the Holocaust. These type of books are always heart breaking to read, but also very educational. I'm glad I read it, but once was enough for me. Friedrich notes his sources in the last few pages of the book, but a lack of citations throughout the book make it difficult to know where he got his information. It is still a brief and interesting read on Auschwitz II. For a book with less than 200 hundred pages, it is packed with facts about Auschwitz. It's remarkable how vast this camp one. If you are interested in WWII or you are looking to expand your knowledge, this is a great place to start. This acid whisper will always be personally linked with a short story by Cortazar. Destiny assumes a more moribund posture in this context. This book opened my eyes to whole new facts I did not know. I thought I knew a lot about Auschwitz, this books showed me I was wrong. Great book about Auschwitz; quotes from many other books/memoirs in this book. One of several books that I donated to the C.A.N.D.L.E.S. Holocaust Museum for their on site Library of Holocaust books.The cover photo never fails to put tears in my eyes. Otto Friedrich - Otto Friedrich was born in Boston and graduated from Harvard, where his father was a political science professor. He took a while to find his literary stride. His career took him from the copy desk at Stars and Stripes to a top writing job at Time, with stops in between with the United Press in London and Paris and with The Daily News and Newsweek in New York.But it was the seven years he spent with The Saturday Evening Post, including four as its last managing editor, that established Mr. Friedrich as a writer to be reckoned with.When the venerable magazine folded in 1969, Mr. Friedrich, who had seen the end coming and kept meticulous notes, delineated its demise in a book, 'Decline and Fall," which was published by Harper & Row the next year. Widely hailed as both an engaging and definitive account of corporate myopia, the book, which won a George Polk Memorial Award, is still used as a textbook by both journalism and business schools, his daughter said.From then on, Mr. Friedrich, who had tried his hand as a novelist in the 1950's and 60's and written a series of children's books with his wife, Priscilla Broughton, wrote nonfiction, turning out an average of one book every two years.They include "Clover: A Love Story," a 1979 biography of Mrs. Henry Adams; "City of Nets: Hollywood in the 1940's" (1986); "Glenn Gould: A Life and Variations," (1989); "Olympia: Paris in the Age of Manet," (1992), and "Blood and Iron," a study of the Von Moltke family of Germany that is being published this fall.He wrote his books, as well as reams of freelance articles and book reviews, while holding down a full-time job with Time that required him to write in a distinct style far different from the one he used at home.Mr. Friedrich, who joined Time as a senior editor in 1971 and retired in 1990 after a decade as a senior writer, wrote 40 major cover stories, the magazine said yesterday, as well as hundreds of shorter pieces, all of them produced on an old-fashioned Royal typewriter that he was given special dispensation to continue using long after the magazine converted to computers.Mrs. Lucas, portraying her father as a New England moralist whose life and literary interests reflected his disenchantment with much of 20th-century culture, noted that his aptitude for anachronism did not end with typewriters. "We have five rotary telephones in this house," she said.In addition to pursuing his eclectic interests into print, Mr. Friedrich also had a knack for turning his own life into art. When he tried to grow roses, the record of his failure became a book, "The Rose Garden" (1972). When relatives were stricken with schizophrenia, his frustration drove him to produce an exhaustive study of insanity, "Going Crazy" (1976).